They're big, unpredictable, and at the top of the food chain. They can run 35 miles per hour for short distances and have a nose better than a whitetail. Despite the allure of danger, the high cost of the hunt, and the limited area that they inhabit, brown bears are probably the ultimate bowhunt - but only if you're prepared. With our hunt just around the corner we'll be sharing with you our preparations, our equipment choices and describe the method in which we'll be hunting these Alaska legends. This nice black bear was spotted on the banks next to the float house. This area is loaded with jumbo black bears. 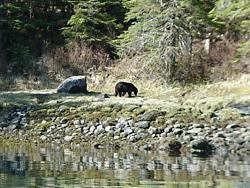 Our hunt will take place on the beaches and bays of Southeast Alaska My guide, Johnny Laird of Muskeg Excursions and I will be hunting both brown bears and black bears by spot and stalk. Johnny has a float-house set up where we will be staying for two weeks. 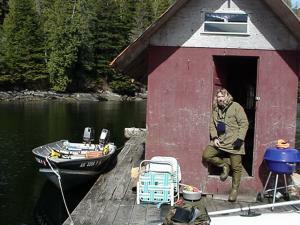 The mornings are relaxed, we'll be checking crab pots and fishing for halibut and other saltwater fish. By late-morning we head out for a long day of hunting, cruising beaches in a skiff, and checking grassy flats for brown and black bear sign. We'll also be looking for kills, and of course, bears themselves. If we find sign, we'll be setting up where we can glass the beach and intercept the bears on their way from the thick jungle-like forests of Coastal SE Alaska Johnny and I have also agreed that if we are having a difficult time finding brown bears, we'll be donning our backpacks and heading up into the hills for a spike hunt. Johnny utilizes a float house where we'll be staying for most of the trip. Every morning we'll head out using Johnnie's skiff. Running, 4-6 miles per day, 5 days per week. Lifting weights, Chest, shoulders, abs, arms and back 4 days per week. The strength training is important and has helped me build up to my heavy bow-weights. each day, sometimes 2-3 times per day but only a few arrows each session. My distance limit is generally 15-20 yards however I've been shooting for form and distance - out to 30 yards or more each day. I vary the distance from 5 yards to 35 every couple of shots. And I'm practicing with the exact setup that I'll be hunting with including broadheads. One of the important aspects to shooting preparation is to try and recreate likely scenarios during hunting. This includes the obvious such as shooting in awkward positions, but it also includes moving shots, snap shots, and shots around obstructions. While shooting at a McKenzie target in your yard will never fully prepare you for a 10' brownie just a few steps away, the goal is to shoot enough that the shot itself is basically automatic. Being a fan of traditional equipment, I had some decisions to make last fall. My 2001 setup was not powerful enough to propel the heavy arrow that I wanted to use for brown bear, so I had one of our sponsors, Bob Morrison of Morrison Archery make me up a new Dakota longbow. It weighs in at 75lbs at 27" - which is my draw length. The bow is 60" long and has an extreme reflex/deflex. For arrows, I had experimented with three different types of carbons, Easton's Carbon Evolution, Arrowdynamic's Nitro Stingers, and GoldTip 5575 Hunters with a weighting system. I ended up choosing the GoldTip's because of the feedback I'd received on the equipment forum as well as the ability to get the arrows within the weight range that I was looking for (700-800 grains). The GoldTips allow you to add variable weights to the nock and point end of the arrow, allowing you to achieve high grain weights as well as a well tuned arrow with regard to Front of Center balance (FOC). The broadhead's I've chosen are the Wensel Woodsman broadhead. These heads are tough and performed very well last season on several critters. The heads are a fixed, 3-blade broadhead in a 3-to-1 design. They are perhaps the best flying broadheads I've ever shot and they sharpen nicely. My finished arrow weight with the broadhead is just shy of 800 grains. Between my arrows and my bow speed of 190 fps, my kinetic energy for this setup is 63 lbs. This is fine for Brown Bear. 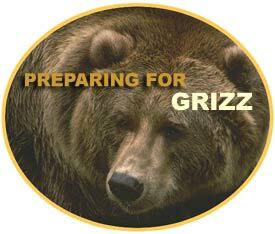 Brown bear hunting isn't for everyone, but when the opportunity presents itself, you better be prepared, both mentally and physically. This is perhaps the most important aspect of a major hunt for dangerous game. 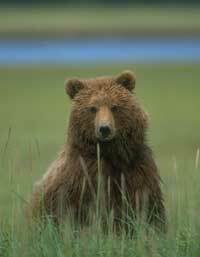 While I deeply respect the brown bear, I am not afraid to bowhunt them again. Last year during our 2000 spring grizzly hunt I stumbled onto a big boar and just a few yards away. Despite the fact that my guide had not chambered a round yet, and we were standing in the middle of this boar's feeding area, I was not afraid or nervous. Positive mental preparation includes building up your confidence through physical and shooting preparation, but also by visualizing a likely scenario at the final moments during a shot. Our Semi-Live Hunt begins on June 5th. 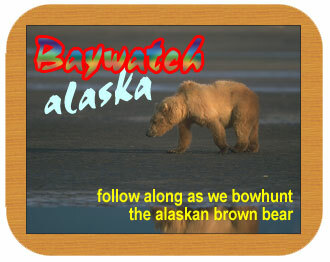 Follow along on our combo bowhunt for coastal Alaskan brown bears and black bears!